Appearance: Morgana has black hair , curly, shoulder length. She can have a cute smile and produce fake tears cause it doesn't do her a thing. She has grey eyes which light up gold when she produces a spell. Powers: She posses the element of water. Personal History: At a young age, Morgana discovered that she sometimes dreamt of terrible things that afterwards came to pass. As the court physician, Gaius gave her a variety of sleeping potions, but none proved particularly effective. Her powers first came to good use against enemies of Camelot when Morgana's dreams aided Merlin in defeating two Sidhe that wished to kill Arthur so one of their own, Sophia, who had been banished to a mortal existence, might return to Avalon . Morgana later became deeply attached to Mordred, a young druid boy whose life Merlin saved at risk of Uther's wrath should his actions be discovered. Morgana was willing to defy Uther and hide the boy in her chambers; however, she was caught when trying to return Mordred to the Druids. Merlin aided in the safe return of Mordred to his people, and Morgana was grateful. In return, she went with him to his home village Ealdor to help him defend it from bandits. 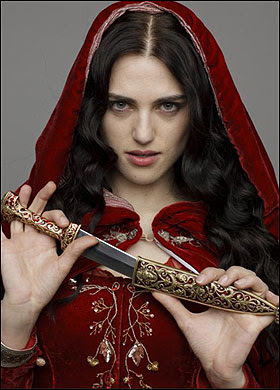 Morgana has persistently been strongly opposed to Uther's ruthlessness towards magic and questioned his choice to execute Mary Collins' son, Thomas (, due to her belief that magic is an inherent quality rather than an active choice. She appeared at times to have an intuitive awareness of Merlin's abilities although she never confronted him with it. From early on, Morgana also showed signs of a darker side. Her bitterness over her father's death and Uther's pivotal role in it caused her great turmoil and ambivalence towards her guardian. This meant that, when exacerbated by Uther's intention to put Gwen to death unjustly and his actual execution of her father on charges of sorcery, her bitterness blossomed into hatred and a desire for an end to Uther's bloody reign. She plotted to have him killed and took an active role in the performance of the intended murder. However, conflicted and weighed by her conscience, she repented of her intention at the last minute when confronted with the realisation that Uther was truly sorry for his actions in the case of both her father and Gwen's father. She then killed Tauren, the assassin, just before he struck Uther down and Merlin killed the other sorcerers involved. Morgana's magic eventually began to reveal itself. When Morgana accidentally set her room on fire and shattered a vase with magic, she became deeply afraid. She went to Gaius and told him she feared she had magic. Gaius knew it to be true, but lied to her in an attempt to protect her. Merlin advised her to seek out the Druids for help and advice, and Morgana eventually found her way to a Druid camp where she was reunited with Mordred. Merlin later arrived, saying Uther believed she had been kidnapped and was going to execute everyone in Camelot who was under suspicion unless she was returned. Morgana did not want to go back, but an army of Camelot soldiers raided the camp and brought her back. Morgana thanked Merlin for what he did for her, saying her experience had taught her not to fear her powers, though she still realised the danger in exposing them. She was terrified of discovery when Uther hired a witchfinder to expose the last traces of magic, and was desperate to keep her secret hidden. She was later taken hostage when the Witchfinder's treachery was exposed, but was saved by Merlin. Arthur mistakenly believed that Morgana and Merlin had romantic feelings for each other. Some time later, Mordred returned, sneaking into Camelot to see Morgana with the sorcerer Alvarr, who asked Morgana to steal a powerful crystal hidden in Camelot's vaults. Morgana eventually agreed and stole the crystal, delivering it to Alvarr's camp. When the crystal was discovered to be missing, Merlin suspected Morgana, having caught her in Arthur's chambers when she was stealing the key to the vault, and followed her to the camp, witnessing her reunion with Mordred. Through Gaius, Merlin gave up the location of the camp and Uther sent Arthur and his men to retrieve the crystal and kill Alvarr's men, forcing Morgana to ride to the camp ahead of them and give Alvarr warning. Despite this, Alvarr was captured, although Mordred was able to escape, and when Uther condemned Alvarr to execution, Morgana told Uther that she disowned him and later used her sleeping potions to drug Alvarr's guards, allowing him to escape. Uther suspected Morgana when he heard Alvarr had help escaping and emotionally informed the court that whoever had been responsible had betrayed him. Sometime later, Morgana found a letter from Morgause, asking her to meet her. Morgana met with her and admitted that she hated what Uther had become, confessing that she once had the chance to be his assassin, but saved his life instead because she believed he was still capable of change for the better. However, she was ultimately disillusioned and realised Uther would never alter his persecution, and that should he ever discover her true nature he would execute her. Morgause then cast a spell without warning, causing Morgana to fall asleep. When Morgana awoke in Camelot, she thought the meeting with Morgause was only a dream, but as the day progressed and everyone around her began to fall asleep, she hid in her chambers until Arthur and Merlin returned. Morgana, afraid of what was occurring around her and helpless to do anything about it, was disturbed when Merlin suggested that Morgause was behind it. Despite his own suspicions, Merlin covered for her when Arthur wondered why she was the only one not affected by the spell, claiming that Gaius must have given her a draught that fought off the sleeping plague before he succumbed to it himself. Merlin later discovers that Morgause made Morgana the vessel for the sleeping plague, unbeknownst to Morgana herself. For the plague to end, either Morgause must undo the spell or Morgana must die. Morgana was therefore poisoned by a reluctant Merlin, who rashly saw it as his only option, and as Arthur fought Morgause's knights, Morgana began to suffocate as the hemlock entered her system, quickly falling unconscious. Across the castle, Morgause became aware of Morgana's plight and realised her sister was dying. In order to save her sister, Morgause agreed to call off the attack in return for Merlin revealing what he had used to poison her, and she then disappeared with Morgana.